Know your community and the issues that are important to them. Know your legislators, their backgrounds, and their positions. Know the organizations that research and recommend policy changes. Go to events. Attend town halls, forums, and other meetings where they are speaking. Come prepared with a question. Be sure to introduce yourself after. Go to the Statehouse. Visit your legislators during session. Contact them in advance to let them know you are coming. Go to their office. Out of session, legislators have more time. Set up a meeting and bring like-minded friends. Personal letters can be very effective. Legislators do read their mail. Typed, handwritten, or email are all fine. Look around our website for ideas on messaging, or use your own words. Encourage others to write. Talk to your legislators. Simply pick up the phone and call their office. You may reach a staffer or leave a message. State the issue, what you want them to do about it, and why it matters to you. Be prepared. Before contacting your legislator, research the issue and plan what you want to say. Be brief. Legislators want to know what you think, but they are very busy, especially during session. Keep letters to 1-2 paragraphs and phone messages to a few sentences. Be firm but courteous. If possible, include praise for a position the legislator has taken in the past. The Alabama Legislature meets every year during a regular session. Sessions are limited to 30 legislative days (when the chambers are on the floor) over 105 calengar days. Although the dates change, regular session usually starts in January and will run about 15 weeks. 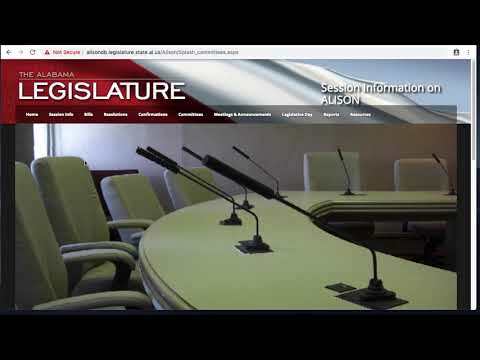 Track bills at the Alabama Lesiglative Information System Online (ALISON). 1. The bill is filed and sent to committee. No bill can become an act until it has been read on three separate days in each house. The first reading occurs when the bill is first introduced. Reference to committee immediately follows the first reading. 2. The committee considers the bill. The committees of each house meet and consider the bills that have been referred to them. Committee members vote to approve the bill, amend it, or send it to subcommittee for further discussion. Bills that receive a majority vote are reported favorably, given a second reading, and placed on the regular calendar. Bills that do not are typically dead. 3. The bill is debated on the floor. Bills are listed on the calendar in the order they are reported from committee. The Rules Committee can vote to place a bill on the Special Order Calendar in order to bring the bill to the top of the calendar. Otherwise, the bill must wait its turn, which can take some time given the number of bills filed. When the bill is reached on the calendar, the bill gets its third reading. At this time, the whole house studies, debates, and amends the bill. Separate votes are taken on each amendment or change to the bill. After the bill has been debated, each member votes. If a 51% majority of those present vote in favor of the bill, it passes. Otherwise, it fails. 5. Repeat steps 1-4 in the other chamber. If the second house makes changes to the bill, the bill is sent back to the house of origin for consideration of the amendment. Both chambers must pass identical versions of the same bill in order for it to go to the Governor's desk. If the second house does not approve it in committee or it is not considered by the full house, then the bill is dead. 6. The Governor decides to sign or veto. When the bill reaches the Governor, if it is signed, it completes its enactment into law. If the Governor disapproves, it can be vetoes and returned to the originiating house for consideration. The legislature can override a veto with a simple majority (51%) vote. Research the issues, and your legislators. Connect with local special interest groups that analyze policy to learn about the bills they are supporting or opposing. Encourage your legislators to introduce bills on issues that you care about. Tell others why legislators need to act by sharing information in person, online, and in the news. NOTE: Check the ALISON Database often. This includes information about all bills, as well as the calendar for the day. Contact committee members to ask them to support, reject, or amend the bill. Recruit your friends to contact them as well. Attend public hearings. Testify at the hearing for or against the bill, particularly if you have a personal story. NOTE: A public hearing request must be submitted to the committee chair BEFORE the bill is set for committee. Contact your legislator to support, reject, or amend the bill. Ask your friends to do the same. Tell people why you think the bill should or should not pass by posting on social media or writing a letter to the editor in your local newspaper. Contact the Governor's office to encourage signing or vetoing. Identify other people who may have special influence with the Governor, and contact them. NOTE: If you don't get the outcome you're hoping for, stay positive. Passing quality legislation takes time.